Julie M. Kuehl Kitchen, Ph.D.
Dr. Julie M. Kuehl Kitchen is an Associate Professor at California State University, Sacramento, an institute of higher education that has become renowned as Sacramento’s only four-year comprehensive university which offers unparalleled opportunities for students to learn, live and succeed. In her current capacity, Dr. Kuehl Kitchen prepares future education professionals to teach physical education, teaches analysis of rhythm and dance, and instructs five dance classes to undergraduate students. She sits on more than 30 committees, supervises student teachers, and performs community service to promote the field of physical education. Dr. Kuehl Kitchen is the writer of “Strategies,” and she integrates physical education and classroom content. She also teaches through plug and play methods on DVD. She became involved in her profession because she knew from an early age that she wanted to work in physical education. Later, she discovered that her niche was in dance. 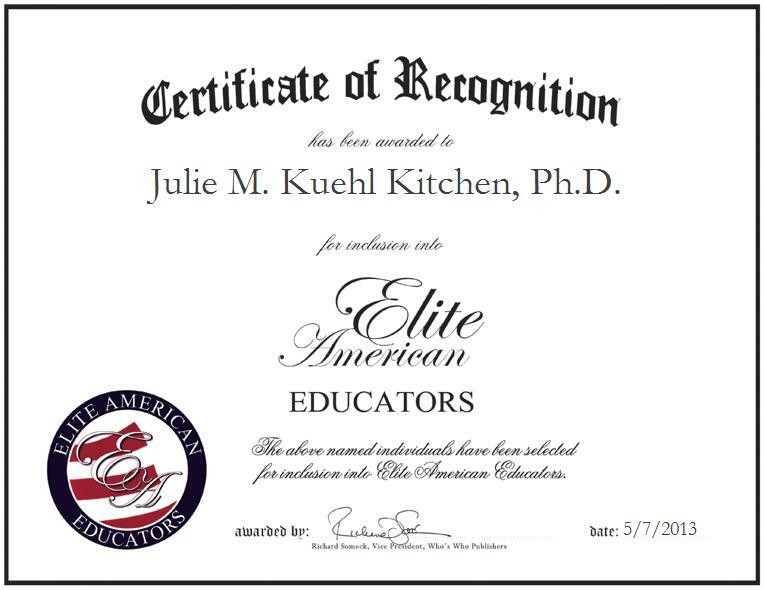 Contact Julie M. Kuehl Kitchen, Ph.D.